NumberLink, available from developer Tapps, is a puzzle game available for the iPhone and iPod touch. The goal behind the NumberLink app is simple: match sets of numbers on grids of varying sizes. Numbers are matched by using your finger to trace a line on the screen from one number to another; these controls are simple and work extremely well. Keep in mind though that lines cannot intersect one another or move diagonally, and that it’s also not enough to connect the numbers; you must also fill every empty spot on the board with your lines. 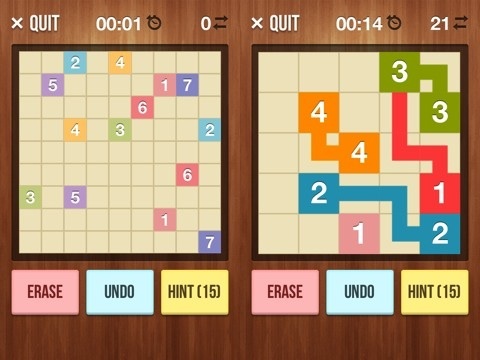 There are three different difficulties in NumberLink: easy, medium and hard, played on a 5×5, 7×7 or 9×9 grid respectively. In addition, each difficulty adds more number sets to match; for example, while the easy difficulty only has only four sets of numbers to match, medium difficulty has seven sets of numbers to match. While NumberLink starts out easy, this app quickly becomes quite a challenge due to the increasing number of numbers to match and the larger sizes of the board. If you become stuck at any point, a hint system can show you the correct path to draw for one of the number sets. However, unlike other puzzlers, you are not given a set number of hints per board; in NumberLink, you are given five hints for the entire game. When those hints run out, your only option is to purchase more from the app store. NumberLink is a free iTouch and iPhone app, offering 20 levels ranging from easy to hard. When those levels are completed, additional level packs can be purchased in bundles of 30 levels for 99 cents. While replay value on completed levels is non-existent, due to their being only one correct way to complete each level, the difficulty of the level packs ensure that most gamers won’t finish them too quickly. The graphics in NumberLink are simplistic and clean; two things you want in any puzzle application. The graphics are bright, colorful and displayed at a high resolution. This clean, crisp style combined with its large icons make NumberLink an ideal application for players of all ages. However, where NumberLink falters is in its use of sound; there is no music whatsoever and the only sound effect is the chime of connecting two sets of numbers. A mellow, relaxing music track would do wonders for NumberLink’s atmosphere. NumberLink ran well without any bugs or glitches; this review was completed on an iPhone 4 with version number 5.1 and performed as advertised. For puzzle aficionados or just someone looking to kill some time, NumberLink is excellent and comes highly recommended. Developer: Tapps Tecnologia da Informacao LTDA. 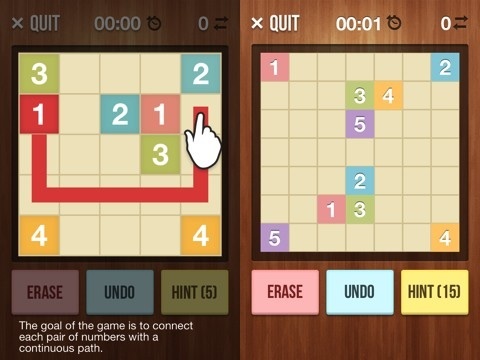 AppSafari review of NumberLink – Sudoku Style Game was written by Joe Seifi on April 6th, 2012 and categorized under App Store, Board, Games, iPad apps, Puzzler, Universal. Page viewed 4395 times, 2 so far today. Need help on using these apps? Please read the Help Page.